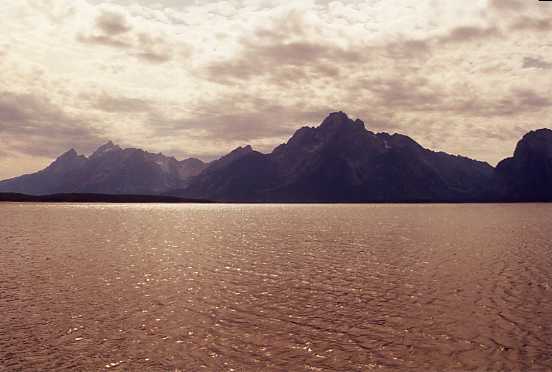 Our stay in Grand Teton was at Colter Bay Village. 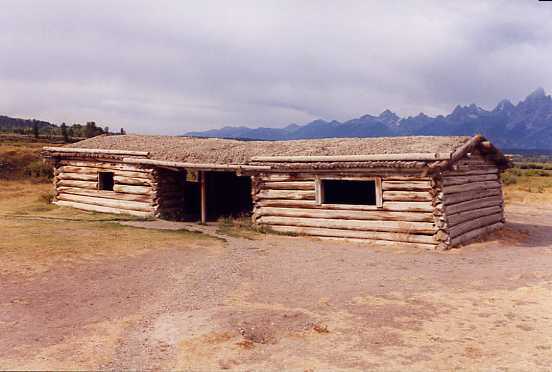 This is a collection of historic log cabins that were all moved up to Colter Bay to form the Village. Some of them are original homestead cabins, some were utility buildings, and some (like the linen closets that were set up for Housekeeping) were previously outhouses (they were cleaned up very well, though). 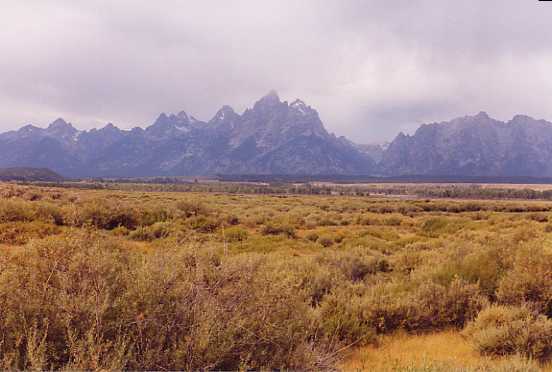 After breakfast at the Chuck Wagon Steak and Pasta House (a restaurant located right in the Village), we headed out to do some touring of the Teton area. 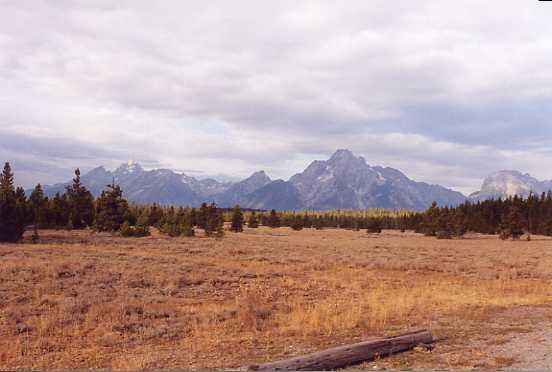 Our first stop was an unmarked turnout South of Colter Bay, where we got our first relatively close picture of the Tetons. 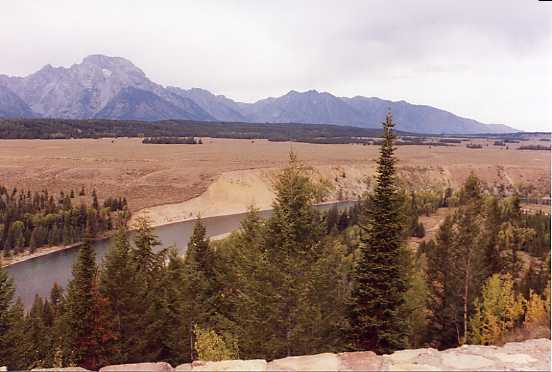 Next, we stopped at Willow Flats, which is just south of Jackson Lake Lodge. 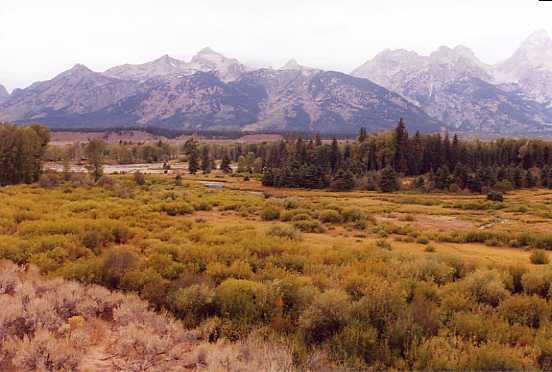 After passing through the Jackson Lake Junction, heading toward Moran Junction, we stopped at a turnout called Oxbow Bend. 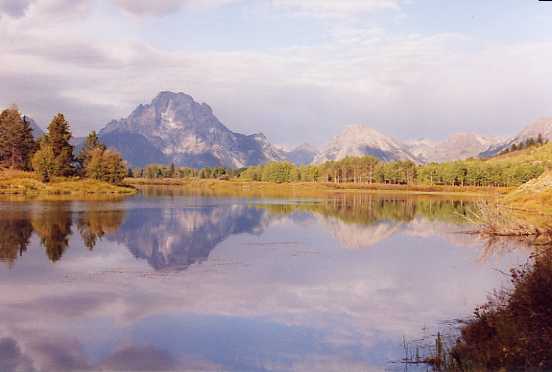 The view from the road was good, but going down a little side trail, we were able to get a nice reflection picture of Grand Teton off the river. 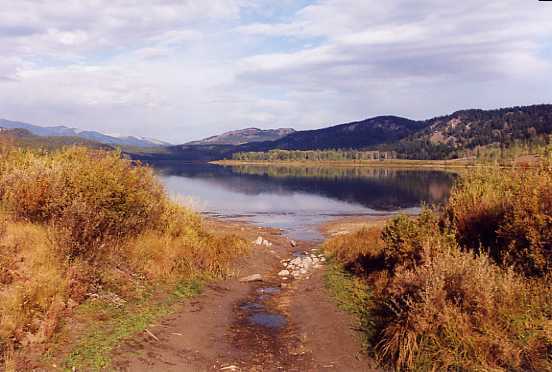 Along the road to Moran Junction, we decided to take a side trip down to Two Ocean Lake. This is a long dirt road leading to a camping/hiking area with some long trails. We saw a couple of muledeer in the road along the way, and got a nice picture of Two Ocean Lake itself. Our plans for a hike were quickly canceled, however, when we heard coyotes howling VERY close by after we were a few hundred yards into our hike. They were somewhere well within a quarter mile, and we decided to play it safe. We got back to the car quickly and headed back down the road. When we got back on the main road, we headed South and came to the Cunningham Homestead, which is an original settlement from 1890 that still stands today. The cabin was used as a residence from 1890 to 1895. The view from the cabin is spectacular, but the winters must have been pretty rough! 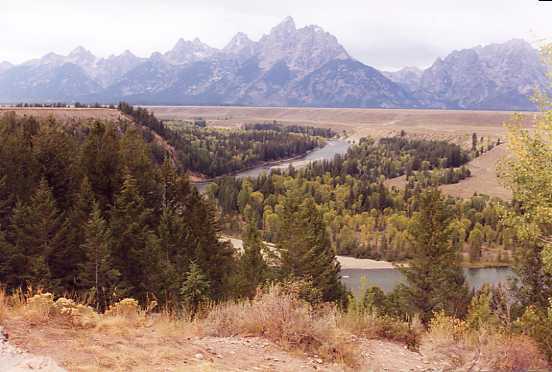 One of the turnouts, Snake River Overlook, gives a good view of a bend in the Snake River and an excellent view of the Tetons. 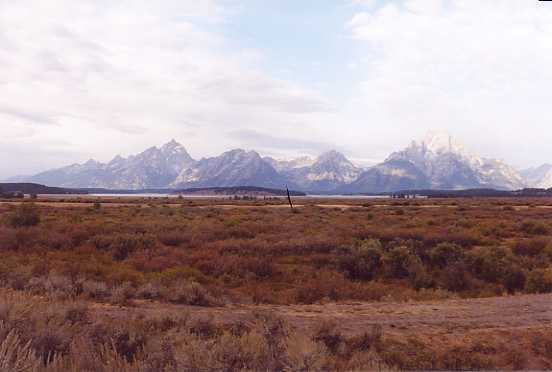 At Teton Point Turnout, we got our best view yet of the Tetons. 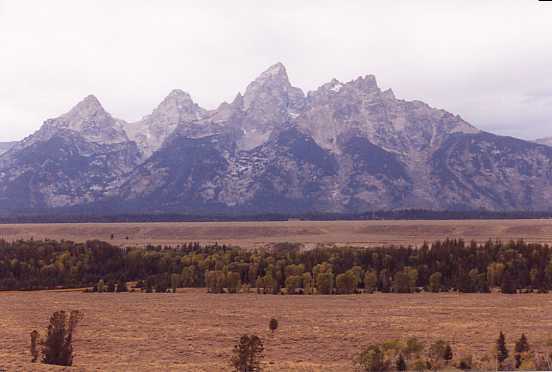 This is a crude attempt at a panoramic view of the Tetons (if your browser does not show these pictures side-by-side, you can try increasing your screen resolution - they look best side-by-side). At Blacktail Ponds Overlook, we saw a pair of moose. 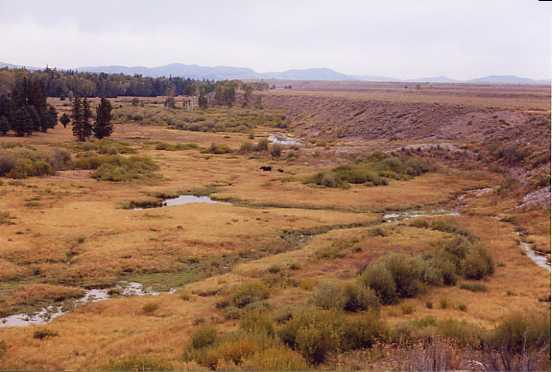 If you look in the first picture below, the moose are just above the center of the picture along the stream. And in keeping with the "moose" theme, our next stop was Moose Pond Trail. 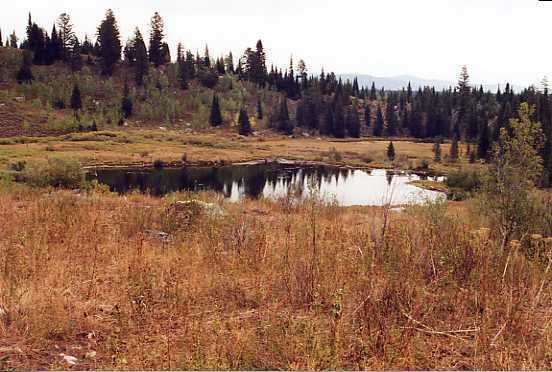 This is a really spectacular hike around a small pond. The trail was a little longer than we thought, so we ended up turning back after a mile or so, but the whole area was fantastic. 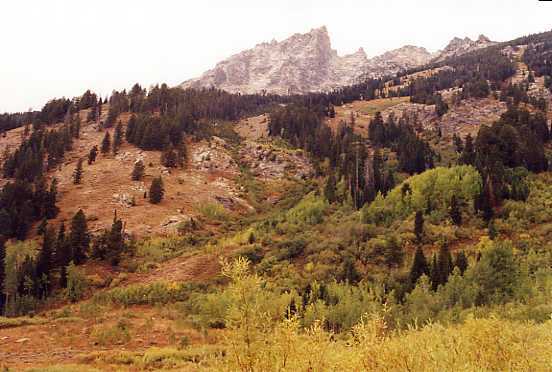 After our hike, we headed back to Colter Bay Village for (guess what?) another hike. 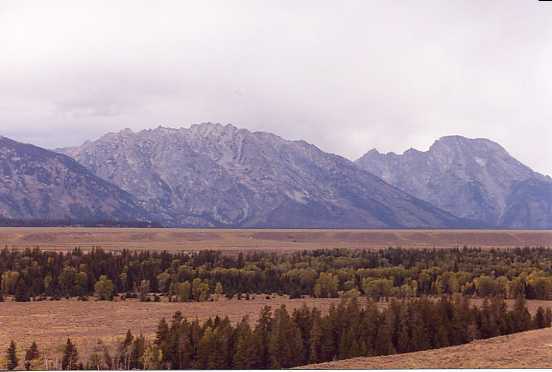 Here are the views of spectacular Colter Bay, known for its fishing and boating activities. 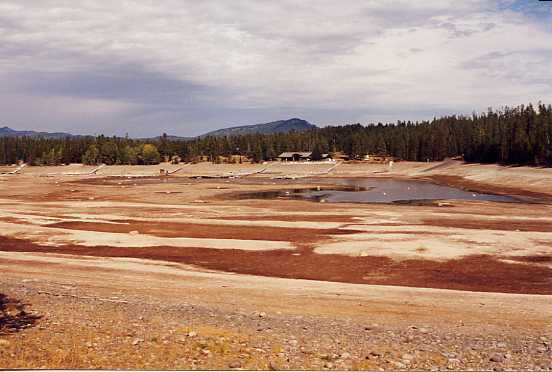 As you can see, the water levels were just a wee bit low this year. 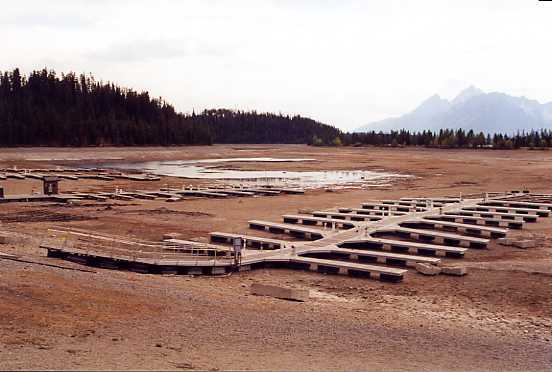 Colter Bay is part of Jackson Lake, but the water was incredibly below normal levels, so Colter Bay was dried up to a small puddle. As we walked to the far side of Colter Bay, we got a good look at Jackson Lake. This picture was taken from about where the water line SHOULD have been. We then followed Lake Shore Trail around an island. 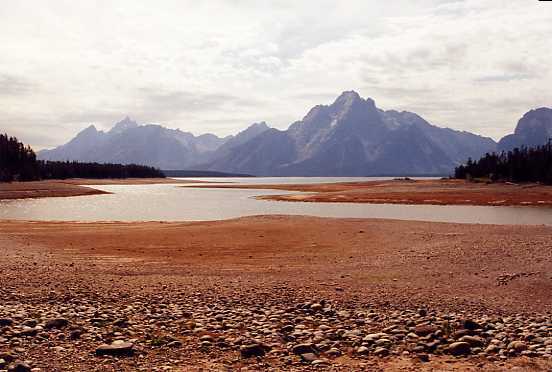 Wanting a picture that didn't include all of the sand and gravel, we walked down to the "new" shoreline and took a picture of the Tetons from the edge of the water. 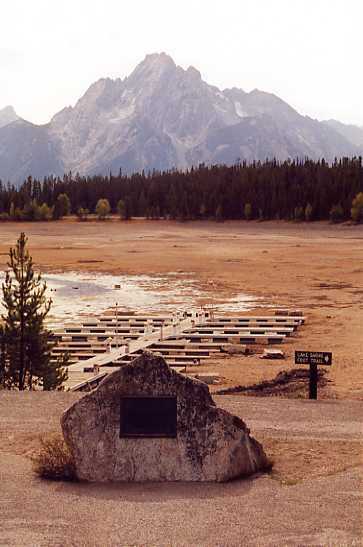 Lake Shore Trail begins (and ends) at a monument with a spectacular view of Colter Bay Puddle. 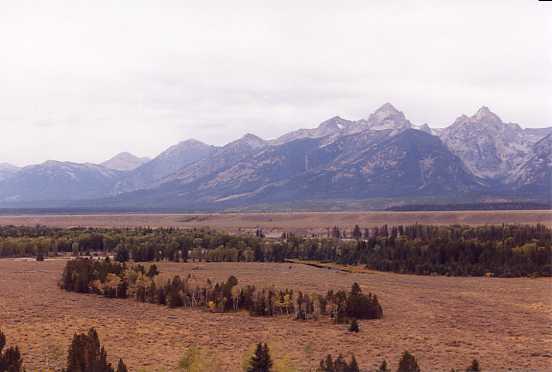 The monument is approximately the same shape as Grand Teton behind it. We then headed down to Jackson Lake Lodge, where we had dinner reservations for the Mural Room, a huge dining room with huge windows facing the Tetons. Their Buffalo Prime Rib is quite excellent, as is their regular steak!